The Frasassi Caves are located within the Regional Natural Park of the Red Gorge. They are a natural spectacle of rare beauty that will enchant you at first glance. Considered one of the most fascinating spectacle of our country, they are the largest complex of underground caves in Europe. These caves are so large that they can hold the entire Cathedral of Milan. 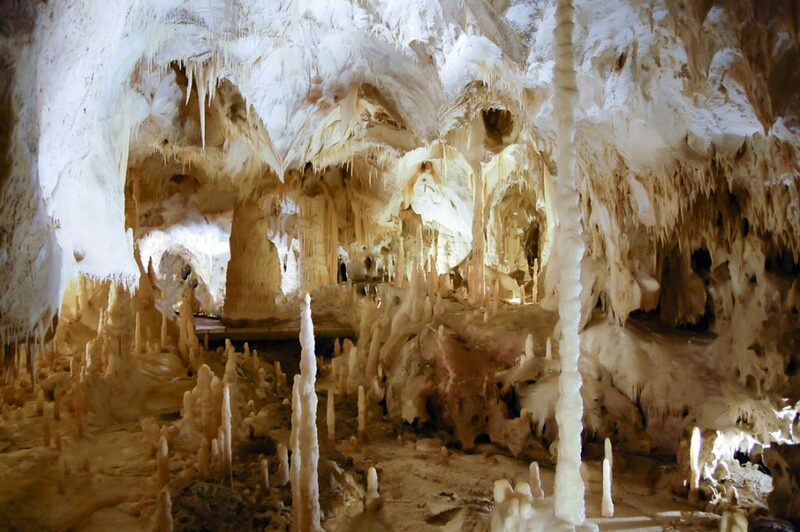 Frasassi Caves are characterized by a set of routes which reach a length of 13 km. Entering this parallel world you will discover amazing natural sculptures of up to 200 meters high; these are the result of the patient work of water and rocks over 190 million years. You will find yourself in front of both stalactites (columns that descend from the ceiling cavity) that stalagmites (which grow from the bottom up). The first best known the “room” is the Abyss Ancona (the name is to remind of the group of cavers from Ancona who discovered it) and it will strike you with its grandeur. Then there is the Cave of the Winds, the Room 200 so called because it is a real natural corridor of 200 meters and with giants stalagmites almost 20 meters high. And then go to discover the White Room that fascinates for its whiteness; the Bear Room where rests a great bear of rock. And then you should visit the Haystacks Room and the Infinity Room: so called because the cavers lost their way and began to turn on themselves. The room that we think it will remain in the hearts more is the Hall of Candles. This is a small and very sweet place where numerous circular stalagmites, placed along the edge of a pond look like candles on a saucer. This room made of precious warm shades of white, ancient waters and slender candles has a special charm. You can visit the caves following three different routes depending on the difficulty and length: tourist, red and blue routes. Inside the caves the temperature is 14 ° and remains unchanged throughout the year and the humidity is 100%. We advise you to bring a jacket and a pair of comfortable shoes. In less than an hour’s drive from Ancona you can reach this wonderful place made of history and nature.